On Wednesday 9th July 1947, King George VI and the Queen made the long awaited statement of the 'betrothal of their dear daughter, Princess Elizabeth, to Lieutenant Philip Mountbatten RN'. On the 70th anniversary of this momentous celebration, we are proud to provide this set of 6 stamps charting HM Queen and HRH Prince Philip's seven years of marriage. 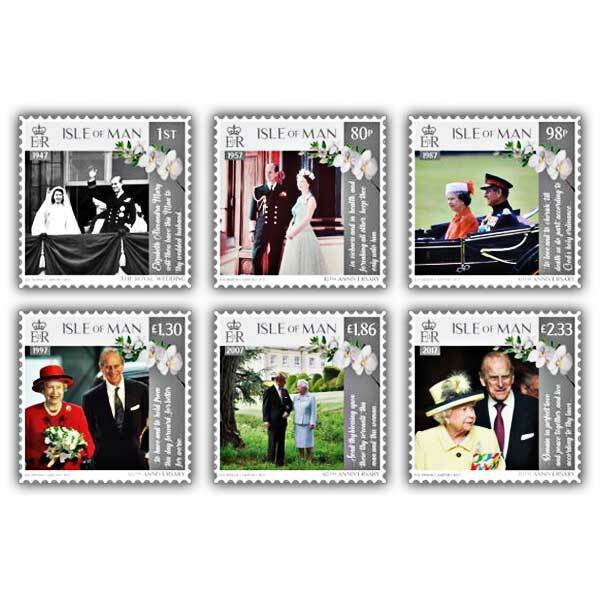 The set of stamps tell the story of the marital relationship of HM Queen through essential events and anniversaries in their 70 year partnership. 1st - HM Queen and Prince Philip on the balcony of Buckingham Palace on their wedding day on 20th November 1947. £1.86 - HM Queen and Prince Philip at Broadlands on their 60th wedding anniversary.